It is the efficient equipment for excellence of water with low elements of buoyancy thanks to its system of flotation by air. The FPAC flotation system is a large surface air flotation system with cross flow separation. The system has been designed to treat wastewater flows heavily loaded with solids that need significant amounts of free surface area for successful flotation and separation (up to 40kg of solids per m² of free surface area inside the system can be treated). Dissolved Air Flotation (DAF) system processes wastewater that are introduced at one end of the apparatus and ejects the clean water at the other end. DAF technology is utilised to remove oils, grease, solids and suspended flocculants that do not possess sufficient buoyancy to float; or where an emulsion of oils and solids (with increased density) require air flotation to enhance the separation process. The use of micro-bubble flotation technology (30 to 50-micron range) increases efficiency, as smaller bubbles easily adhere to equal-sized or larger particles, boosting the overall effectiveness of the system. The FPAC flotation system is a large surface air flotation system with cross flow separation. The system has been designed to treat wastewater flows heavily loaded with solids that need significant amounts of free surface area for successful flotation and separation (up to 40kg of solids per m² of free surface area inside the system can be treated). The FPBC flotation system is a high-built separator designed to treat low to medium loaded waste waters, even those containing low buoyancy particles. 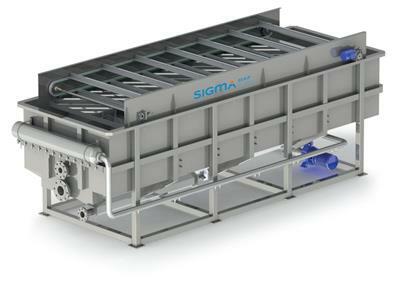 No reviews were found for SIGMADAF - Model FPAC - Dissolved air flotation system. Be the first to review!